As a driver, you want a clutch in your car or truck that’s easy to use and lasts a long time — that’s not too much to ask! Exact fitment, smooth engagement, and stock pedal feel is something every driver should get out of a clutch kit. These are the key characteristics our clutch kits are engineered around. When your car or light duty pickup truck is in need of a replacement clutch kit, you can count on Phoenix Friction to deliver the best quality kit for your application. 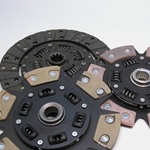 We offer over 1,300 clutch kits in our car and light duty truck clutch catalog alone! Our listings range from the 1950s through the vehicles of today. Each five-piece standard clutch kit through Phoenix Friction includes a cover assembly, disc assembly, release bearing/busing, and alignment tool. All of the components in our kits are carefully chosen based on their durability, dependability, and their value so we can pass the savings on to you, the customer. We offer a huge selection of kits that range from direct replacement kits to high performance kits meant to handle heavily modified vehicles. Our clutch kit line for street performance vehicles ranges from stages 2 to 6, and are made from heavy duty organic linings, heat resistant and long lasting kevlar linings, and performance orientated ceramic buttons. Check out our selection now and find the kit best for your car or truck by entering your year make model information in the boxes above. 01-206 Clutch Kit: Jeep Wrangler 3.6L - 11 in. 01-207 Clutch Kit: AMC Ambassador Gremlin Hornet Javelin Matador Rebel - 10 in. 01-208 Clutch Kit: AMC Ambassador Gremlin Hornet Javelin 232cid 258cid 304cid - 10 in. 01-506 Clutch Kit: Jeep CJ5 CJ7 - 10-1/2 in. 02-011 Clutch Kit: Audi 4000 5000 Coupe, VW Quantum - 9 in. 02-018 Clutch Kit: Audi 5000 CS S Quattro - 9-1/2 in. 02-020 Clutch Kit: Audi 80 90 100 Quattro - 9-1/2 in. 02-021 Clutch Kit: Audi 200, 200 Quattro - 9-1/2 in. 02-022 Clutch Kit: Audi 80 90 2.0L - 9 in. 02-023 Clutch Kit: Audi 90 Quattro, Coupe Quattro 2.3L - 9-1/2 in. 02-024 Clutch Kit: Audi S4 2.2L - 9-1/2 in. 02-025 Clutch Kit: Audi 90 100 A4 A6, VW Passat - 9-1/2 in. 02-026 Clutch Kit: Audi S6 2.2L Canada - 9-1/2 in. 02-027 Clutch Kit: Audi A4, A4 Quattro, A6, A6 Quattro, VW Passat GLS, GLX V6 2.8L - 9-1/2 in. 02-028 Clutch Kit for Dual Mass Flywheel: Audi A4, VW Passat 1.8L Turbo - 9 in. 02-028CK Solid Flywheel Clutch Conversion Kit: Audi A4, VW Passat 1.8L Turbo - 9 in. 02-028CK.3C Solid Flywheel Stage 3 Ceramic Clutch Conversion Kit: Audi A4, VW Passat 1.8L Turbo - 9 in. 02-040 Clutch Kit: Audi TT Quattro, VW Beetle, Golf GTI, Jetta GLI GLS GLX - 9-1/2 in.